Genealogybank.com is a new favorite website of mine. I’ve been using it for about a year. It’s collection includes historical newspapers, the social security death index, recent newspapers, historical documents, historical books and so on. The records I search for most frequently are recent obituaries – within the last 30 years. I have had some excellent luck finding obituaries filled with clues that led me to other records. I also have a subscription to newspaperarchive.com. The two websites have some overlap but most of the time I find items on one website or the other but not both. Genealogybank is very user friendly. Items load quickly and are easy to navigate. This is a very well run website. If you are looking for clues about a relative who died within the last 30 years I would definitely give genealogybank a try. They offer a one month trial for $9.95. A bargain! 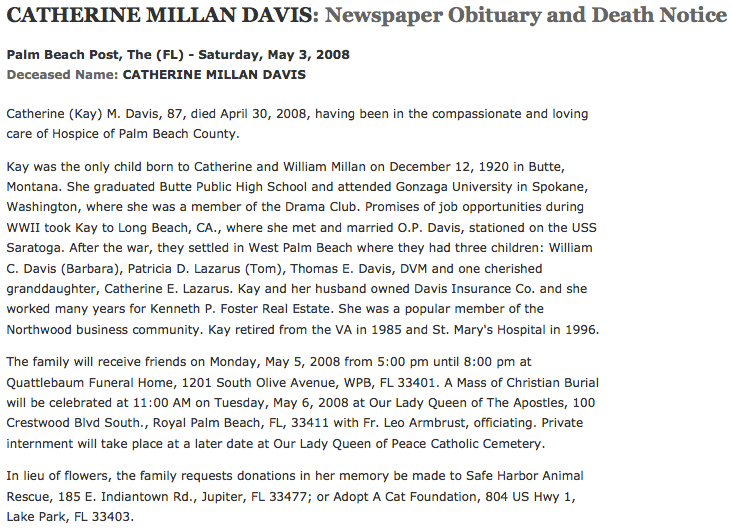 Below is one of my favorite finds, an obituary for a long lost cousin. I wrote about finding her here. Give genealogybank.com a try. Let me know if it helps your research!